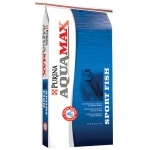 New AquaMax® Sport Fish MVP is a multi-variable particle product with nine different sized extruded nuggets designed with both Sinking and Floating action. New MVP helps expand the feeding trough vertically to feed a greater percentage of different sized fish in your pond helping smaller fish grow. 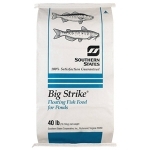 Southern States Big Strike Fish Food is a complete diet for growing warmwater pond fish over 6in length. The floating formula allows food to be available for longer periods of time to ensure all fish have the opportunity to eat. 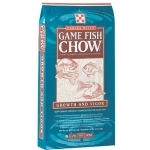 The 3/16in pellet size is ideal for larger fish and contains fish meals and oils to attract fish and encourage consumption.